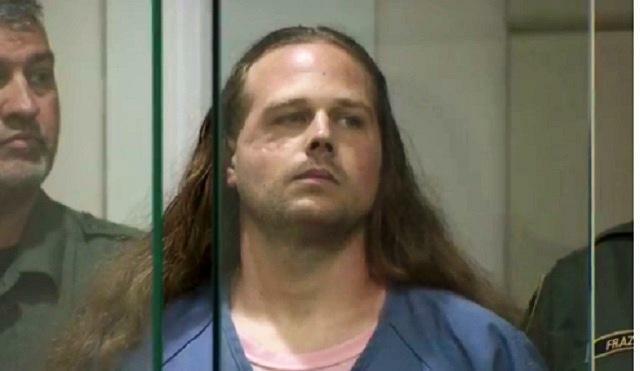 PORTLAND, Ore. -- A suspect made repeated verbal outbursts Tuesday as he appeared in court to face charges that he fatally stabbed two men and wounded another after yelling hate speech at two young women, one of whom was wearing a hijab, on a Portland light rail train Friday. A defiant Jeremy Joseph Christian made his first appearance Tuesday afternoon before Judge Paul G. Crowley at the Multnomah Justice Center. As the 35-year-old entered the courtroom, he yelled about free speech before saying, "Death to the enemies of America. Leave this country if you hate our freedom." "You call it terrorism, I call it patriotism," Christian said. "You hear me? Die." The outbursts were followed by a commotion outside the courtroom. Micah David-Cole Fletcher, 21, suffered a slash wound to his neck and chest as he tried to confront Christian and help the young women. Two other men who also came to the aid of the young women -- Ricky John Best, 53, and Taliesin Myrddin Namkai-Meche, 23 -- were killed in the incident. Police reports say Christian is seen on surveillance video yelling racial and anti-Muslims slurs at the two young women and attacking the men, who intervened, with a knife, CBS News' Mireya Villarreal reports. Fletcher told investigators Christian "threatened to decapitate people." Late Tuesday, the Associated Press reported that recently released court documents for the first time mentioned a fourth man who was the first to intervene and was not attacked, but they did not identify him by his full name. Police said they'll examine what appears to be Christian's extremist ideology, including social media posts indicating an affinity for Nazis and political violence. Fletcher, recently released from the hospital, appeared in the courtroom during the brief hearing along with family of victims and supporters. Christian is charged with two counts of aggravated murder, two counts of second-degree intimidation and one count of attempted aggravated murder, one count of first-degree assault and three counts of unlawful use of a weapon, reports CBS affiliate KOIN. He has been appointed public defenders. Lane Borg, the head of the local public defender agency, said the office was "saddened by this tragedy" but urged people to let the justice system take its course. Tuesday, Christian's case was assigned to a judge and an attorney requested a speedy trial. In the probable cause affidavit, prosecutors said video feeds in the back of a patrol car captured Christian saying after his arrest that he had stabbed three people in the neck. His court-appointed attorney, Gregory Scholl, did not immediately return a call for comment. The deaths stunned the city, but also underscored nervousness about recent events, including a series of apparent hate crimes in the region and contentious public rallies that have drawn national attention. The Pacific Northwest has a long and violent history of white supremacist and other racist activities, despite its more recent reputation for being one of the nation's most socially liberal regions. "The idea that Portland is so liberal supersedes this dark, hidden secret about racism," said Karen Gibson, a professor of urban studies at Portland State University. Many of the early settlers to Oregon were from Southern states and brought with them negative attitudes about blacks, Gibson said. Only about 6 percent of the Portland population is black, while more than 70 percent is non-Hispanic white, statistics show. Some residents said President Donald Trump has caused those racist demons to stir again with his administration's travel ban, his promise to build a wall along the border with Mexico and his crackdown on illegal immigration. Since Trump's election, Portland has led all major metropolitan areas in reported hate crimes, Mayor Ted Wheeler's office said. "I don't have that feeling like it can't happen here -- the way people talk about Portland -- because we've got racism. We've got all kinds of things," said Murr Brewster, who came to see a memorial at the city's transit center. "It's everywhere and the trouble is, it's getting more and more prevalent."